The Portuguese archipelago of Madeira lies southwest of the mainland in the North Atlantic, comprising Porto Santo, Desertas and Madeira. Recently named ‘Europe’s best island destination’ at the World Travel Awards, these volcanic islands are a haven for nature enthusiasts, beach bums and food lovers. Madiera boasts a rich and diverse wildlife as well as a stunning natural landscape. The Laurisilva forest blanketing the northern slopes of Madeira Island is the world’s largest, a UNESCO World Heritage Site and home to a number of endemic species including the extremely rare Madeiran large white butterfly and Trocaz pigeon. In Funchal, the capital city, be sure to visit the fascinating Quinta das Cruzes Museum. Formerly a traditional manor house owned by the man who discovered the islands, Joao Goncalves Zarco, it now features exhibits of various antiques, paintings and jewellery that belonged to the rich owners who lived there from the 15th to the 19th Century. For a livelier affair, stroll through Funchal's Zona Velha (Old Zone) and take your pick of the trendy bars and top quality restaurants. The area was, until recently, filled with abandoned fishermen’s cottages and merchants’ houses but is now characterised by a network of vibrantly coloured, narrow cobbled streets. If you’re feeling peckish, be on the lookout for local favourites like fried fish with banana or an espetada, a skewer of grilled beef chunks marinated in the famous Madeira wine. Porto Santo offers a peaceful retreat from the animated towns on Madeira and boasts a 9 kilometre long, pristine golden beach with sand believed to have healing properties, so there's plenty to do in this stunning archipelago. There are frequent crossings from Porto Santo to Funchal on Madeira Island lasting just over 2 hours. 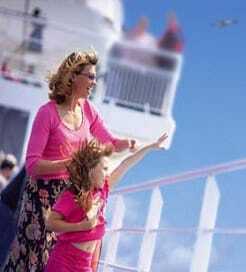 For more information, please visit our Ferries from Porto Santo Island to Madeira Islands page.